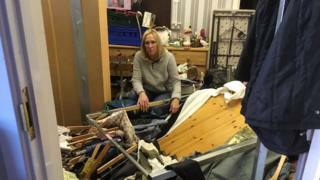 A food bank charity said it "would have helped" thieves who broke into one of its shops on Merseyside. Cash and food were stolen from the Big Help Project on Carr Meadow Hey in Bootle after burglars forced entry at about 06:45 on Sunday, police said. Chief Executive Peter Mitchell said: "If someone had needed help, if someone had needed food and support we'd have given them it." The charity, which also runs a clothes shop, said repairs will cost £700. The Big Help Project provides support for people in poverty, offers financial advice and organises food banks. Mr Mitchell added: "If someone had needed help with their finances or getting back to work, we'd have given them it. "They didn't need to kick in the door and wreck the place, and nick the till and the food - they really didn't." Food Club Coordinator Trish Barkey, said repairs were under way and the food bank which helps over 300 local people, will be open as usual on Wednesday. She said: "We don't want this to stop us from opening. A lot of people depend on us". Police said inquiries are ongoing and asked anyone with information to get in touch.